Operation Blacklist served as the supreme model to combat continuing resistance from the Japanese following formal surrender. As the months of 1945 passed at an agonizingly slow pace, Allied forces in the Pacific struggled unwaveringly toward Japan. Expectedly, during the summer of 1945, Allied forces led by the United States faced the prospect of invading the Japanese home islands. The overarching plan for the invasion and occupation of Japan was code-named Operation Downfall. Kyushu, the southernmost of the four home islands, would be the first attacked and occupied. Planning for the invasion and occupation of Kyushu, code-named Operation Olympic, began even as the fighting on Okinawa raged in the spring of that year. After the difficult victory on Okinawa, American-led forces faced the dreadful prospect of continuing the fight on the home islands of Japan in which tens of millions of Japanese would wage conventional then unconventional warfare with no foreseeable end. As they demonstrated on Guam, Saipan, Tinian, Peleliu, Iwo Jima, Okinawa, in the Philippines, and on numerous other islands, the Japanese intended to fight to the death. Not only was surrender by Japanese soldiers forbidden, so too was surrender by Japanese civilians. On Saipan, Japanese civilians held out until there was no hope in their view. Instead of surrendering or being captured, many of these civilians, including mothers holding their infants, leaped from rock cliffs to their deaths. Consequently, Allied forces faced brutal fighting in the pending conquest of Japan. Allied planners estimated that an invasion and occupation of Kyushu Island alone would require 766,700 ground forces. Allied casualties were expected to reach 105,000 just to seize the southern part of Kyushu, more than double the casualties sustained fighting on Okinawa. Even before the issuance of Operation Olympic and before he knew of the existence and intended use of the atomic bombs, General MacArthur directed his staff to begin developing Operation Blacklist in May 1945, to address the possibility of surrender by or complete collapse of the Japanese government. Assumptions for Olympic, including expected casualty ratios, led Allied leaders to seek the unconditional surrender of Japan. The Potsdam Declaration, requiring unconditional surrender, was issued in July 1945. However, the Japanese did not provide a timely response. Consequently, as late as August 14, Allied military leaders did not know which operation, Olympic or Blacklist, they would execute. Fortunately for all parties, the Japanese surrendered following the dropping of the atomic bombs on Hiroshima and Nagasaki. Initially, the military leadership opposed the terms of surrender, but after much internal wrangling and confusion, the Japanese government, on August 14, 1945, officially announced its surrender and acceptance of the terms outlined in the Potsdam Declaration. The most important point for the Japanese was the continuation and protection of Emperor Hirohito. The Japanese conceded everything else required in the Potsdam Declaration. General MacArthur was named Supreme Commander for the Allied Powers (SCAP), and the various parties met on the morning of September 2 for the formal surrender ceremony aboard the battleship USS Missouri in Tokyo Bay. Because the Japanese achieved their primary goal of keeping the emperor in his position and continuing the imperial system, albeit with much reduced authority, the Japanese did not unconditionally surrender. Nonetheless, it would be Operation Blacklist. Insurgencies are not necessarily small wars, as evidenced by the protracted Chinese communist insurgency against the nationalists and the potential for insurrection in Japan. Additionally, insurgencies often develop in response to occupations by foreign powers, such as those in Afghanistan, Algeria, Iraq, Malaya, Palestine, Spain, Vietnam, and numerous others. During World War II, some Allied leaders, particularly MacArthur, understood all of this from education, experience, and events preceding the war, including lessons from such historical conflicts as the American Revolution, Boer War, American Indian Wars, and the Philippine Insurrection. Consequently, the announcement and formal surrender by the Japanese did little to assuage U.S. military concerns regarding the occupation and demilitarization of Japan. These were key premises of General MacArthur’s plan in successfully occupying Japan in 1945, which was the crowning achievement of the Allied forces in the Pacific Theater of World War II. Unfortunately, to the detriment of many, this model of counterinsurgency and occupation is often overlooked by military and political leaders and historians because there were no armed battles to discuss or analyze. It was simply not sensational in terms of armed conflict, maneuvering, and military tactics. Yet, when viewed in terms of countering the largest potential insurgency ever faced by an occupying power, incontrovertible actions and principles become apparent. In 1945, the population of Japan was approximately 80 million. The Japanese National Volunteer Force consisted of 25 million nonmilitary men, women, and children, ready to support their military, defend their homeland, and fight with whatever means they could muster. Before the occupation in 1945, SCAP headquarters estimated that more than 1,700,000 former members of the Japanese military would have to be disarmed along with 3,200,000 civilian defense volunteers. Even the Japanese leadership worried over its ability to get the surrender order disseminated with authority and credibility to not only the military but the entire population. When informed that the first occupation troops would arrive on August 23, historian Samuel Eliot Morison writes, “the Japanese asked for more time, stating the problem of controlling their own armed forces and pleading that delay would enable them to prevent regrettable incidents.” The Japanese military was so strongly opposed to surrender that “hotheads in the Japanese Army Air Force threatened to shoot down any surrender mission that took off” from Japan to meet with the Allies. In September 1945, American troops of the 81st Infantry Division come ashore on the Japanese home island of Honshu. These soldiers constituted a portion of the 3rd Amphibious Force that occupied key locations in Japan. (1) Destroy the military power. (2) Punish war criminals. (3) Build the structure of representative government. (4) Modernize the constitution. (5) Hold free elections. (6) Enfranchise the women. (7) Release the political prisoners. (8) Liberate the farmers. (9) Establish a free labor movement. (10) Encourage a free economy. (11) Abolish police oppression. (12) Develop a free and responsible press. (13) Liberalize education. (14) Decentralize the political power. (15) Separate church and state. a. Destruction of hostile elements which might oppose by military action the imposition of surrender terms upon the Japanese. b. Disarmament and demobilization of Japanese armed forces and their auxiliaries as rapidly as the situation would permit. Establishment of control of military resources insofar as would be practicable with the means available. c. Control of the principal routes of coast-wide communication, in coordination with naval elements as arranged with the appropriate naval commander. d. Institution of military government, if required, and the insurance that law and order would be maintained among the civilian population. Facilitation of peaceful commerce, particularly that which would contribute to the subsistence, clothing and shelter of the population…. f. The securing and safeguarding of intelligence information of value to the United States and Allied Nations. Arrangement with the U.S. Navy for mutual interchange and unrestricted access by each Service to matters of interest thereto. g. Suppression of activities of individuals and organizations inimical to the operations of the Occupation forces. Apprehension of war criminals, as directed…. i. Preparation for the imposition of terms of surrender beyond immediate military requirements. j. Preparation for the extension of control over the Japanese as required to implement policies for postwar occupation and government, when prescribed. k. Preparation for the transfer of responsibilities to agencies of the post-war governments and armies of occupation, when established. The key method in which U.S. occupation forces carried out these “Special Tasks” was by employing the Japanese themselves to do the majority of the work. MacArthur and his staff never intended for American troops to actually conduct all of the specific work necessary for accomplishing the numerous goals of the occupation. It was emphasized that in view of the limited forces that would have to occupy a country of roughly 80 million, Army commanders would make all possible use of Japanese demobilized forces … and would take all steps to insure that public servants, such as the civil police, railway workers, communication workers, utilities operators and public health officials, not only remained at their tasks but intensified their efforts to ensure a continuation of all functions under what was certain to be a period of great stress. Just two and a half years following the surrender, approximately 5,700 war criminals were tried by the International Military Tribunal for the Far East, which found 920 of them guilty. Many of the guilty were hanged. Around 200,000 ultranationalists were purged out of public offices. Shinto was discontinued as the state religion. Large companies were broken up. Land reform was initiated, and the civil service was reconstituted. Following SCAP instructions and priorities, primarily Japanese forces under U.S. military supervision destroyed over 11,000 aircraft, more than 1.2 million rifles and carbines, almost 190,000 artillery pieces, and approximately 1.2 million tons of ammunition. Additionally, hundreds of naval vessels and other equipment and weapons were destroyed. At least 135 naval vessels were delivered to the Allies for their use. The most common method of destroying or disposing of explosives and ammunition was dumping at sea. Amazingly, in less than three years SCAP implemented and oversaw all of these actions and those outlined earlier, affecting a population of 80 million with just over 200,000 troops. 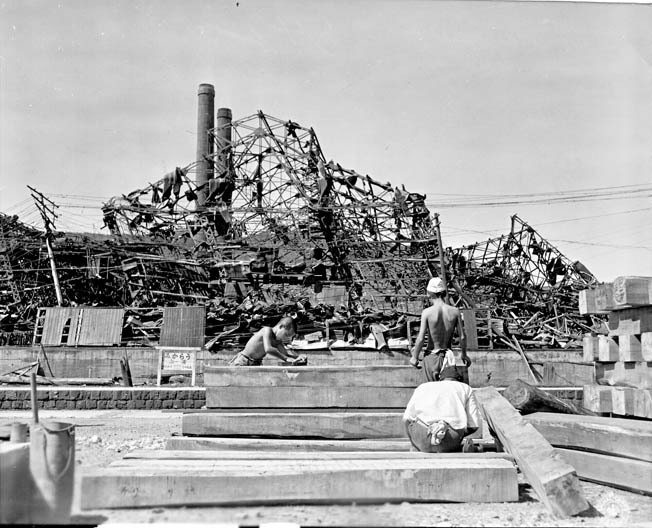 Japanese laborers stripped to their waists set to work rebuilding structures demolished by the atomic bomb dropped on the city of Nagasaki on August 9, 1945. Law and order and public security, some of the most essential issues of counterinsurgency, were well understood by MacArthur and his staff. Accordingly, MacArthur’s decisions regarding Emperor Hirohito were twofold. First, he decided not to prosecute Hirohito, which for the most part alleviated the certainty of a massive insurgency. Second, he left Hirohito in his imperial position with somewhat more than just symbolic power. In the long term, this second action ensured tremendously important continuity of control and authority over the Japanese population. Another important benefit of MacArthur’s actions regarding Hirohito was legitimacy, an indispensable aspect of successful counterinsurgency. In addition to leaving the emperor in place and successfully opposing his war crimes trial, MacArthur attained and increased the respect of the Japanese people and cemented his own legitimacy as supreme commander for the Allied powers, in effect, the legitimate ruler over Japan. This legitimacy was also conferred upon MacArthur by the emperor through public appearances, broadcasts, and speeches, all of which further suppressed any incipient insurgency within the Japanese population. All of these aspects of the occupation permitted the Japanese population to respect MacArthur and the occupation troops and to accept the postwar rules, regulations, and laws imposed by the Allies. The peaceful and tranquil transition of postwar Japan, especially when compared to occupations of other postwar nations, was the ultimate success of the occupation and was in large part due to the work of intelligence organizations. However, in addition to the possibilities of a general insurrection among the greater Japanese population, several factions or organizations posed problems for the governing forces. In preparation for and response to these groups, MacArthur wrote that the various intelligence organizations early on and consistently developed “intelligence information on every shade of public unrest—in the field of labor, in communist infiltration, and in movements of disillusioned, repatriated military personnel,” of whom there were millions. Organized along geographic lines, the counterintelligence organization effectively monitored and mitigated the JCP by working with and through the Japanese police, preventing any significant opposition to the successful occupation of Japan and the peaceful transition into a democratic form of government. In 1950, due to stern measures ordered by MacArthur in relation to the outbreak of war in Korea, the JCP was practically eliminated as a national entity of any influence. Although it would reemerge much later, the JCP never presented a significant threat to the occupation and democratization of Japan. Fortunately, during and immediately after World War II, the American and Allied forces were led by intelligent, experienced, and educated men. Their primary motivation in avoiding a massive, long-term invasion of Japan was to save lives and resources. Their experiences in amphibious landings, kamikaze attacks, land warfare, and naval warfare provided ample information and statistics to use in analyzing the exceedingly difficult mission of militarily seizing and occupying the Japanese home islands. Although the government of Japan agreed to surrender, it did not mean that the soldiers, sailors, airmen, and civilians would honor the terms of surrender, nor did it prevent the Japanese from changing their minds at some later date, only to resume fighting against the occupying forces. The formal signing of the surrender documents did not preclude those in the field from continuing the fight. Additionally, many combatants, especially in 1945, simply did not or could not receive word of the surrender. Because of the Japanese stated intent to surrender, instead of landing in force as he did on Leyte Island in the Philippines, General MacArthur on August 30, 1945, took a tremendous risk and bravely flew into Atsugi Airfield in Tokyo aboard a simple cargo plane with just a small staff element before any substantial number of occupation forces were in place. He eventually met with and broadcast respect for Emperor Hirohito. His plan involved having the emperor order the Japanese people to lay down their arms and discontinue fighting, alleviating the need for American troops to forcefully invade and physically implement postwar policies under martial law. By leaving the emperor in place and using him to order the Japanese military and general population to cooperate, MacArthur prevented that potential, enormous insurgency. His face-saving plan for the emperor ensured the greatest possible peaceful transition and reconstruction of Japan. In fact, MacArthur’s approach was so successful, the first completely free election ever held in Japan was on April 10, 1946, only seven months after the formal surrender, and it included 75 percent of eligible voters. 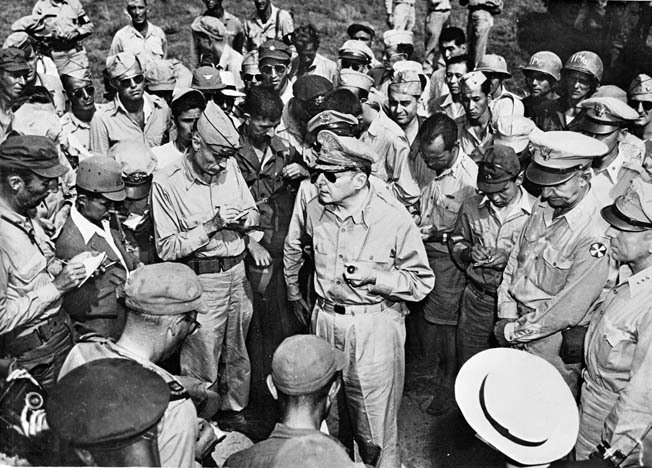 Shortly after his arrival in Japan, General Douglas MacArthur, who led the American occupation forces and ordered Operation Blacklist to deal with either the surrender or the collapse of the Japanese government in late 1945, takes questions from reporters. Conversely, had MacArthur yielded to the British and Soviet ideas by rebuking and publicly shaming Emperor Hirohito or trying him for war crimes, the entire Japanese population would have fought boldly to oppose the Allied occupying forces, which the Japanese would have perceived as attacking, blaspheming, and discrediting their deity, the emperor. Viewed in another way, had MacArthur stripped Emperor Hirohito of all his formal authority and titles and publicly shamed him by showing a humiliated, unkempt emperor—bedraggled, broken, and handcuffed or imprisoned—the Japanese would most certainly have fought against the occupying forces for years, likely decades. Hundreds of thousands of casualties would have resulted in the attempt to pacify the Japanese, and the rebuilding of the nation would have been set back many years. SCAP’s actions in no measure dismissed Hirohito’s knowledge and tacit approval of many of the cruelties, crimes against humanity, and war crimes committed by Japanese forces and leaders. Yet, MacArthur wisely permitted Hirohito to remain in power and position as the emperor and necessarily included him in the restructuring and rebuilding of postwar Japan, at the same time ensuring their own legitimacy in the eyes of the Japanese. By December 1948, just over three years after the surrender, MacArthur declared amnesty for 17 men awaiting trial for Class A war crimes, specifically those who had led Japan during the war. Later, he commuted death and life imprisonment sentences of many found guilty of war crimes. He also lifted the order for apprehending fugitive war criminals. He also granted amnesty to Class B and C defendants accused of abuse or atrocities. Such reconciliation was hard for many among the Allied nations to accept, but MacArthur clearly understood the benefits of forgiveness and the need to move on to rebuilding Japan. Ultimately, these policies effectively eliminated any incipient or potential insurgencies and ensured the successful restructuring of Japan along with the security and stability of 80 million people within only three years. Unfortunately, the remarkable lessons in leadership and command in countering insurgencies and conducting occupations have been lost among many who have led efforts in subsequent and similar operations. For example, the Coalition Provisional Authority (CPA) and Coalition forces in the early years of occupied Iraq could have used a situation for a period of time in which Saddam Hussein, or certainly some of his key ministers and military and police leaders, worked with the Coalition forces to suppress nascent insurgencies. There were several distinct insurgent organizations in Iraq. With these known leaders ordering police and military units back to duty to restore law and order, the insurgencies could have been contained and might not have developed at all, preventing years of conflict and thousands of casualties. After all, Iraqi leaders were no guiltier of atrocities than many of the Japanese leaders with whom the Allied forces worked in postwar Japan. In other respects, the analogy between postwar Japan and Iraq or occupations of other nations diverges and is not meant to be an absolutely pure analogy with exact correlations throughout but instead a contrast. However, the general parallel and the specific actions taken by occupying forces are important and relevant, particularly for future conflicts and occupations, of which history warns there will be many. History provides ample political and military lessons, such as those exemplified by MacArthur and validated in Japan, that permit experienced and learned, well-intentioned leaders to successfully execute counterinsurgencies, occupations, and other forms of political-military conflict. For President Harry Truman and the Allied powers in postwar Asia, General of the Army Douglas MacArthur epitomized such a leader. Fittingly, MacArthur’s Operation Blacklist, often forgotten precisely because of its unequaled success in preventing an enormous, long-term insurrection, stands supreme above all other modern counterinsurgency and occupation operations. Lieutenant Colonel Michael F. Trevett is a U.S. military officer with 29 years of service. He has trained or operated with the civilian, military, or police forces of over 40 nations and territories on antiterrorism, counterdrug, counterinsurgency, law enforcement, and search and rescue issues, operations, and tactics. In 2011, he published Isolating the Guerrilla, a book on counterinsurgency. Tags Allies, atomic bomb, Axis, Counterinsurgency Warfare, General Douglas MacArthur, General MacArthur, Harry S. Truman, Hirohito, Hiroshima, Japan, Japanese, Nagasaki, Occupation, Okinawa, Operation Blacklist, Pacific Theater, Potsdam Declaration, Surrender of Japan.